I am a published author and professor specializing in Philippine minorities, focusing on 1900-1920. 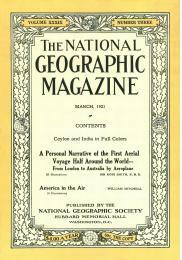 How can I access your National Geographic collection for those years? A couple of other options: 1) if you have specific articles you are interested in, then your public library should be able to retrieve them via Interlibrary Loan. Also, 2) if you have a DVD player on your computer, this set of the complete NG on 6 DVD-ROMs (1888-2012) may be of interest: https://www.amazon.com/gp/offer-listing/B00GVFI028/ It’s available used for ca. $50, so if you are interested in browsing specific issues, it might be of interest.